Z Hostel i Irkutsk, Rusland: Reservér nu! If you are travelling to Siberia and want to meet like-minded friendly people Z hostel is the place for you. We offer modern, fully equipped private and shared accommodations. A dishwasher, a dryer, long-term storage room are all free of charge for our guests. All beds are at least 2 meters long. Our kitchen and lounge areas are fantastically equipped with everything a traveller would need. 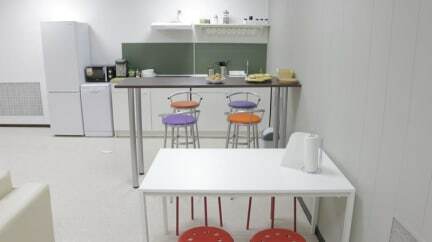 Z Hostel is centrally located in the City’s Old Town, on the corner of the main street Karl Marx and Gryaznova. Our neighbourhood offers Siberia’s best restaurants, cafes and bars amidst most of the sightseeing routes. 3,5 km to train station, 1,5 km to bus station, 5,5 km to airport, right in the heart of the old capital of Siberia. We provide a safe and comfortable place to stay: free high-quality bed linen and towels, read-light and an outlet at every bed, 24-hour hot shower, wireless Internet, modern fully equipped kitchen, large common areas, free laundry and more. Our English-speaking, friendly staff is ready to assist you 24/7. We will help you book a ticket or tour, order a taxi or just help with an advice. Free parking is available right outside the hostel. When you register at the hostel, please provide the document proving your identity. Smoking is prohibited and only allowed in designated Smoking areas.